Box of 20 Flapjacks: You can purchase a single box or multiple boxes of any flavour of flapjacks from this page. 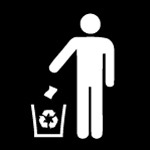 The multi-box discounts are automatically applied to your shopping cart. If you would like to purchase a mixed flavour box of flapjacks, click HERE to use our BUILD A BOX feature and choose the flavours you prefer. Our TORQ Explore Flapjacks are soft, syrupy and deliciously tasty as well as being organic and suitable for vegans or those who prefer a plant-based diet.  Our Soil Association Organic certification means that the ingredients used in these flapjacks are from the purest sources, free from the pesticides and chemicals used in modern intensive farming. Organic ingredients also provide a richer, more wholesome flavour, something that immediately becomes apparent when tasting our flapjacks. Available in delicious Organic Apple Strudel, Organic Ginger Cake and Organic Carrot Cake flavours. 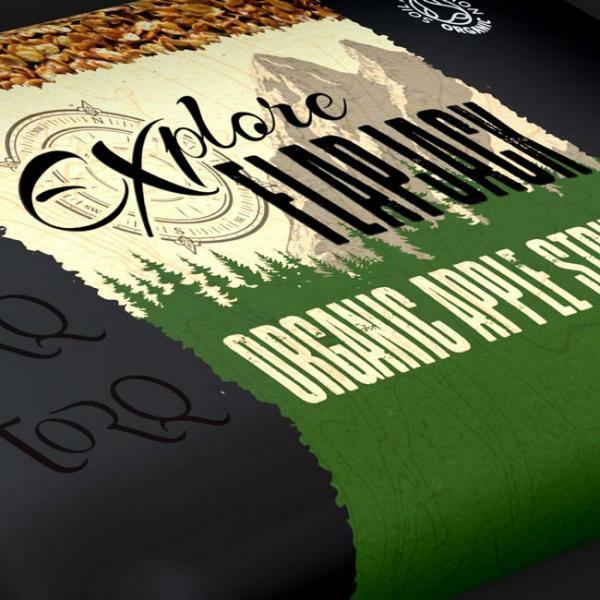 Enjoy your Explore Flapjack as a healthy natural snack at any time of day, or why not take this scrumptious homely goodness with you as you pursue your next adventure, wherever that might be? Our Explore range of products have been designed with the physically active person in mind. Our energy-enriched flapjacks have all the credentials of highly competent energy bar as well as being luxurious and tasty enough to consume at any time of day as a treat with a cup of tea of coffee. 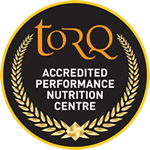 Renowned for our cutting-edge Performance Nutrition products, TORQ are no strangers to the concept of fuelling performance to the highest level. If you want an Energy Bar that will give you faultless performance and optimal energy delivery during high intensity endurance exercise, don’t hesitate in choosing our unrivalled class-leading TORQ Energy Bar. If on the other hand you’re a little more relaxed about your physical performance and you’re just looking for flavoursome, homely, energy-enriched goodness whilst pursuing your active lifestyle, look no further than our TORQ Explore Flapjacks. You may be using our performance-formulated TORQ Energy Bars whilst training and competing, but want to enjoy a tasty organic snack with a cuppa whilst you’re chilling out to help replenish your valuable glycogen stores? The TORQ Explore Flapjack accepts no boundaries – take it anywhere and everywhere! 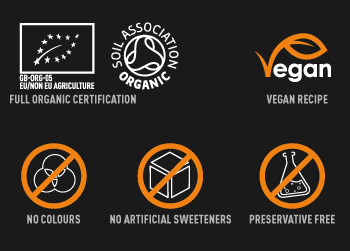 Core to TORQ’s ethos is our commitment to purity and the use of organic ingredients where possible and this has been of primary importance during the development of our flapjacks. 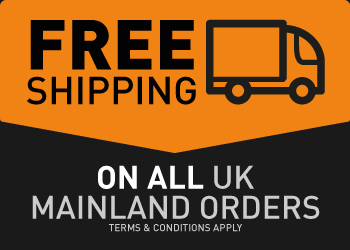 We are also renowned for producing highly functional energy products and these flapjacks certainly have the signature of TORQ engrained within them. They are packed with useful carbohydrate (43g per 65g bar) to help fuel performance and facilitate recovery, delivered not only from the organic oats, fruit, molasses and syrup, but also from organic maltodextrin, a low osmolality complex carbohydrate glucose polymer with superior carbohydrate delivery properties. The TORQ Explore Flapjacks are organically pure, highly functional and of course delightfully delicious. Nutritional Information for all flavours of TORQ Explore Flapjacks are supplied under this tab. Ingredients: Organic Jumbo Oats, Organic Golden Syrup, Organic Dark Brown Sugar (Organic Dark Brown Sugar, Organic Molasses), Organic Sunflower Oil, Organic Raisins (9%), Organic Maltodextrin, Organic Dried Apple (6%), Organic Ground Cinnamon (0.6%), Sea Salt. For allergens, including cereals containing gluten, see ingredients in bold. Due to manufacturing methods, these products may not be suitable for customers with an allergy to nuts, sesame seeds, milk, soya and other cereals containing gluten. Ingredients: Organic Jumbo Oats, Organic Golden Syrup, Organic Dark Brown Sugar (Organic Dark Brown Sugar, Organic Molasses), Organic Sunflower Oil, Organic Maltodextrin, Organic Carrot Powder (0.4%), Organic Ground Nutmeg (0.2%), Sea Salt. Ingredients: Organic Jumbo Oats, Organic Golden Syrup, Organic Raisins (14%), Organic Dark Brown Sugar (Organic Dark Brown Sugar, Organic Molasses), Organic Sunflower Oil, Organic Maltodextrin, Organic Ground Ginger (0.6%), Sea Salt.